My fifth grade world — a typical one concerned with classes, friends, recess, lunch menus and dreading middle school — forever changed one day, when I sat on the ABC-patterned carpet in my classroom and watched my favorite teacher hide tears from the class. I first met her in third grade. She was always peppy and affable — our school’s own Ms. Frizzle. Yet that day she was overcome with grief from the loss of her husband due to brain cancer. This is the first time I had ever heard of the disease or witnessed the grief it can cause. In response, I declared (as the confident 11-year-old that I was), “One day, I am going to fix that problem.” I have been working toward this goal ever since and was even voted “most likely to find a cure to a disease” my senior year in high school. Now I’m a second-year graduate student in a brain cancer research laboratory. My laboratory focuses on developing therapies for brain cancer by repurposing FDA-approved drugs. We use preapproved drugs because developing a new anticancer prodrug, testing the drug in a biological system, getting it to clinical trials and using it as a widespread therapy can take up to a decade or longer. I know that my colleagues and I share a similar dream: to someday prevent and cure cancer. Each day I try to do more to contribute to my field, but I can easily get bogged down by the workload and coursework. But my motivation catapulted when cancer hit close to home. My aunt has stage 4 ovarian cancer and the current therapeutic treatments have not been helping her. The oncologists keep saying it’s very aggressive. Most phone calls from my mom include her questions about what the doctors have said, followed by my explanations of the biology or a synopsis of the most recent journal articles in an attempt to provide mediocre knowledge as comfort. It pains me to know that I can’t just go into the lab and bring out the cure for every person who is suffering. I understand that this type of cancer isn’t my specific field of research, but it is cancer and my family is experiencing what my fifth grade teacher went through 12 years ago. I know so many have already made calls to action to fight this disease, because cancer affects so many people. My call to action is not to work longer hours or pick up the pace. We, as researchers, are already working hard. Instead, I ask that people who do research always keep the end goal, and the people we are trying to help, in mind. We can easily get lost in the daily tasks that ultimately contribute to the big picture in scientific research. 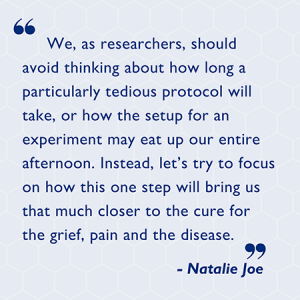 We, as researchers, should avoid thinking about how long a particularly tedious protocol will take, or how the setup for an experiment may eat up our entire afternoon. Instead, let’s try to focus on how this one step will bring us that much closer to the cure for the grief, pain and the disease. 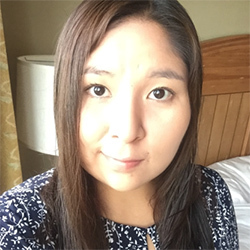 Science is never just about one graduate student at their bench; it’s about all the people who have helped this student achieve their dreams, their families’ support and the other families waiting to hear that this disease is no longer a threat. This is the lesson my aunt’s illness has taught me, and I will use this as motivation to continue working toward my goal of developing therapies for brain cancer. I know scientific progress is rarely about one hero’s journey. We all need to work together. So, fellow researchers, keep in mind that science isn’t about your day to day; it’s about the progress we see from one decade to the next. 2 Comments on "When Cancer Hits Home: A Researcher’s Call to Action"
Amen brother! I am dealing with carcinoid cancer in the family. Let's beat this stuff. Some of the cancers get a ot of attention others don't but we got to fight. Thank you for your inspirational message. Thank you for taking the time to read my article. Also, my heart goes out to your family and I will keep your in my thoughts! We can definitely work hard to beat this disease! !